Best Wooden doors manufacturer in Madurai Best Wooden Door Manufacturer Provider in Tamilnadu Almighty door is the best wood manufacturer shop in Madurai. We are having Readymade Wooden Doors for our immediate needed Customers. We are the topmost Wooden Main and Interior Doors Dealers and vendors for all Madurai clients and customers.we are producing the Wooden Main door, new Teak Wooden door with enough Quality at an affordable cost for our customers. Popular Wooden Door Manufacturer Provider in Tamilnadu Almighty Door is one of the Popular Wooden Door Manufacturer Provider in Tamilnadu.And they are having new Teak Wooden Door with good prices for Madurai Customers.They are Providing all over Tamilnadu and people trusting this wood manufacturer shop in Madurai. We are manufacturing the most popular wooden doors, wooden entrance doors, wooden dining table the supplier in and around Tamilnadu. We are also Exporting Foreign Countries too. We Have Stock Benin Teak, and Burma Teak (Myanmar) sufficient quantity. We are importing woods as logs (Big & Small) as well as required sizes. 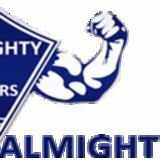 For Further Contact, Visit: http://www.almightydoors.com/ Mobile: 9787242526, 9751152526 Address: Suresh Timbers (Head Office), Near Govt Hospital, M.Kallupatti Road, Elumalai â&#x20AC;&#x201C; 625535. 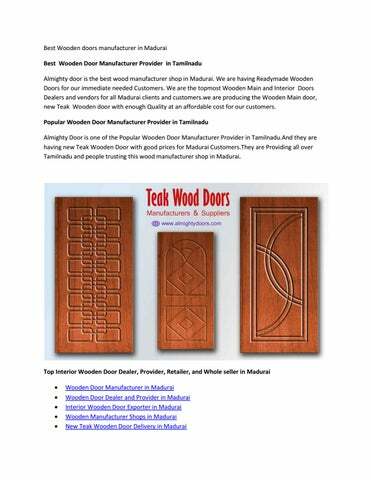 Tags: Wooden door Manufacturer in Madurai, Wooden doors manufacturer in Madurai,Wooden doors supplier in Madura,Wooden Door in Madurai, Interior wooden door,solid wooden door in Madurai,wpc doors,Madurai wood shops,door manufacturer in Madurai,wooden door in Madurai,Interior Wooden Door Manufacturer in Madurai,Wooden Door Dealer and Provider in Madurai,New teak Wooden Doors in Madurai,Interior Plywood Door Supplier in Madurai,Entrance Door Manufacturer in Madurai,Entrance Door Supplier in Madurai,Wooden Manufacturer Shops in Madurai,Readymade wooden traders in Madurai.